Glen Cove Road is the major road across the diagonal. The Long Isand Motor Parkway can seen across the top. The Long Island RR can be seen on the left. Old Country Road is on the far left running parallel to the LIRR. 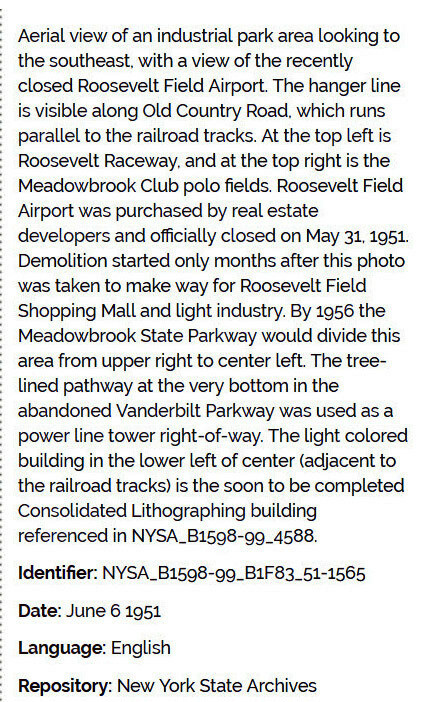 Which Motor Parkway structures can be seen in the Mystery Foto? The Mineola LIRR Motor Parkway Bridge can be seen in the right corner. A blurry Old Country Road Motor Parkway Bridge can be seen on the top left of the Mystery Foto. 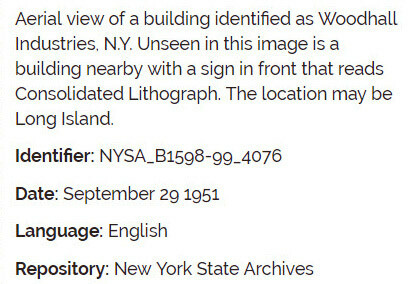 The large building was Consolidated Lithographing, soon after relocating from Brooklyn. 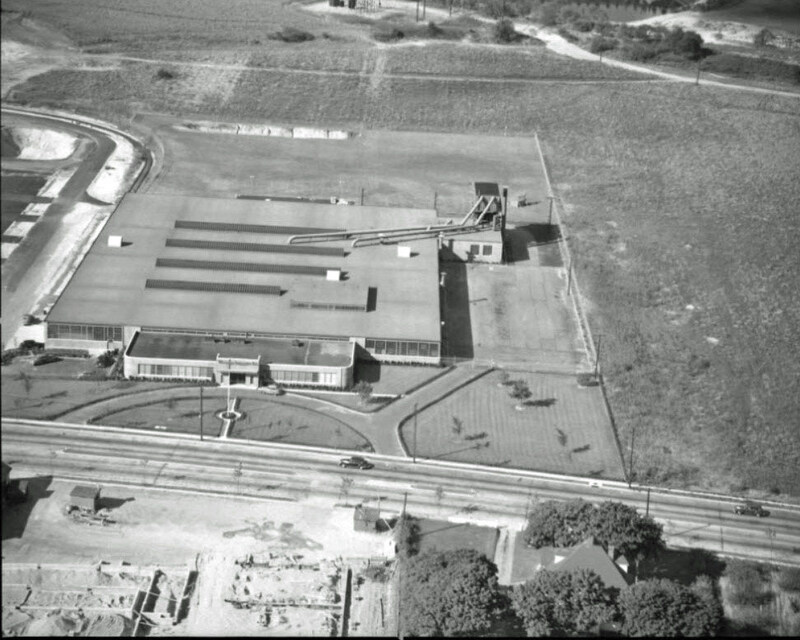 The factory on the right was Woodhall Industries. The road between the two factories would later be named Voice Road after the Consolidated Lithograph founder Jacob A. Voice. 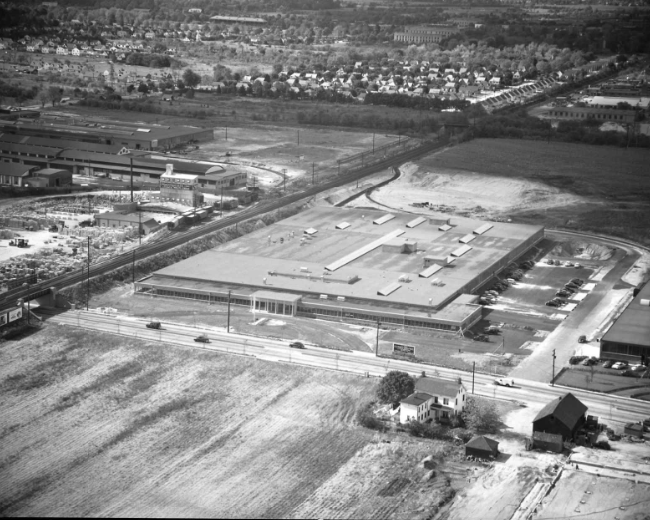 Other buildings south of the LIRR were Laboratory Furniture and the buildings of the Smith and Hicks farms. This image can be found in which online digital collection? 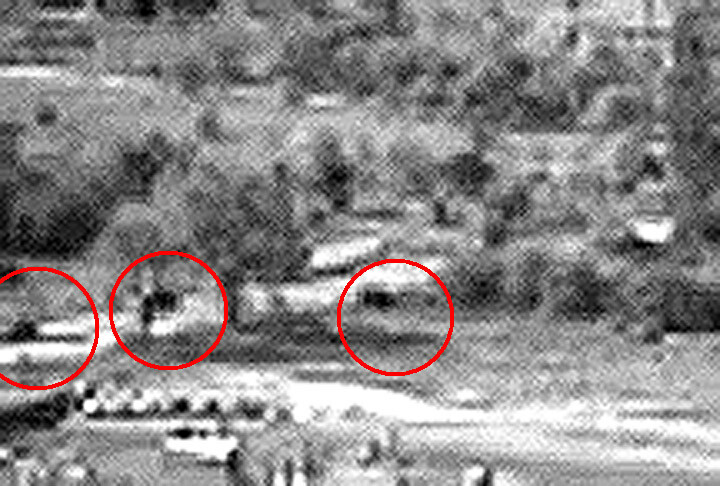 What was the date of the Mystery Foto? Congrats to Greg O., Joe Oesterle, Art Kleiner, Steve Lucas, Ernie M., Frank Mendyk and Al Velocci for identifying the Carle Place location and the Mineola LIRR Motor Parkway Bridge. Kudos to my favorite co-author Al Velocci for noting that Voice Road was named for the founder of Consolidated Lithographing. The Consolidated Lithographing Corporation, Brooklyn, New York was one of the largest printers of paper labels in the early 20th century. Jacob A. Voice formed the Consolidated Lithographing Corporation around 1925 by merging with Wm Steiner & Sons lithographers (1896), which was formed from Steiner & Rosenthal (1884). The Brooklyn Eagle, Sunday, July 16, 1944 contains an article relating to Jacob A. Voice. 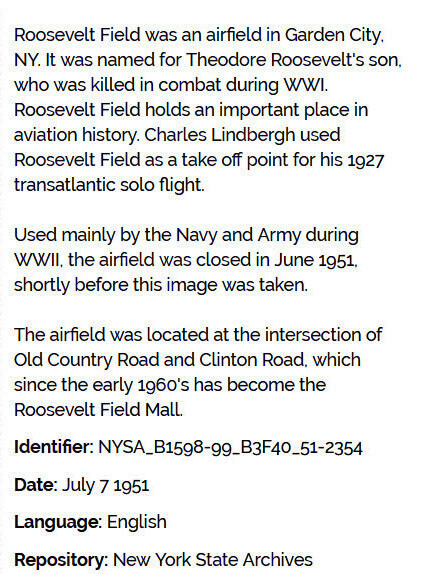 The article states that Jacob A. Voice (1884-1942) was the organizer and former president of his company. Born in Romania in 1884, he immigrated to the US at the age of three. In 1903, Voice began working for Wm Steiner & Sons & Co. and by he 1911 had organized his own company. 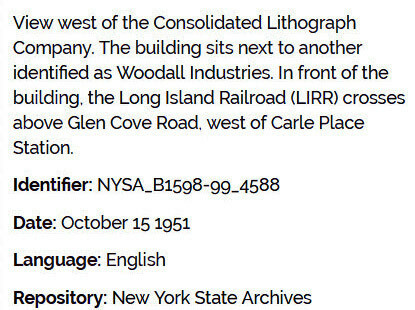 In 1925, the name of his firm changed to Consolidated Lithographing Corporation. 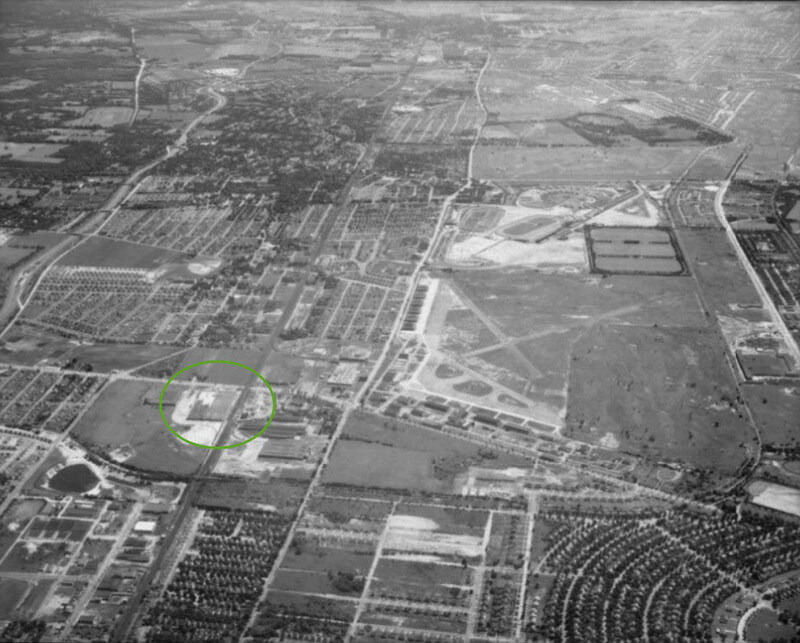 The Consolidated Lithograph building is circled. 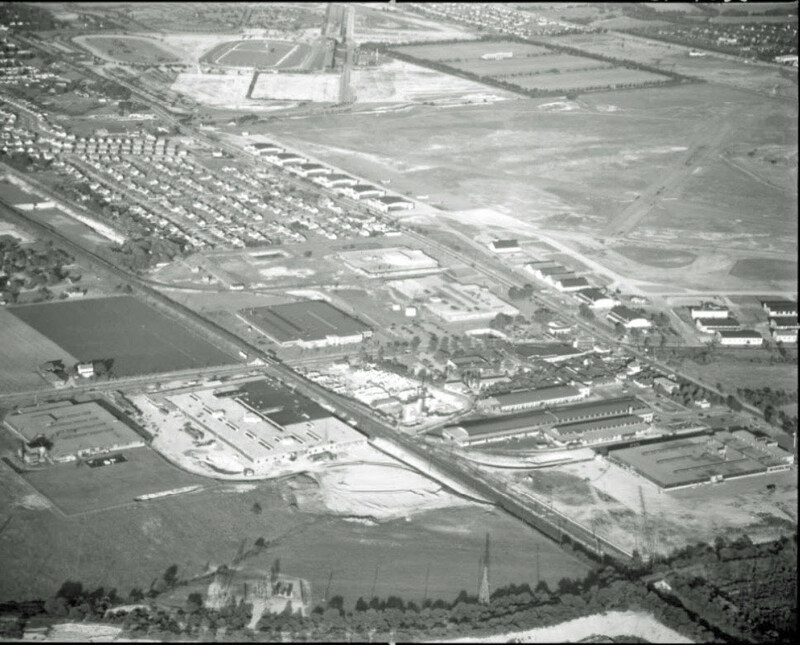 Note: Roosevlet Raceway used for the 1936 and 1937 Vanderbilt Cup Races was still standing in 1951-used for harness racing. View looking southwest. The LIRR Motor Parkway Bridge can be seen in the lower right corner. -Mineola Rail Road bridge is the only structure since it looks like the Old Country Rd bridge was gone by the time of this picture. I need to revise my answer and include the Old Country Rd Bridge as a LIMP structure as it was still standing until the 1960’s. The picture is over Carle Place, looking southwest. The LIRR is seen crossing over what is today Glen Cove Rd. Voice Rd heads west. Old Country Rd is seen in the upper left. The LIMP Mineola bridge crosses the LIRR in the upper middle. To the left the parkway will dip down and go under Old Country Rd. I do not know the names of the buildings. The building on the right, I believe, is still there. The small warehouse spur of train tracks, for many years, wound through the area. Up by the LIRR itself, a small portion of those tracks are still there. It took a few moments to get my bearings on this. But great picture. View looking southwest in Carle Place. 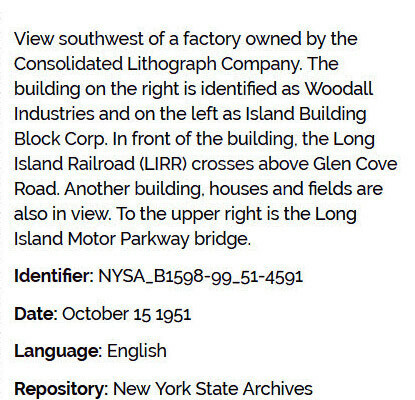 Consolidated Lithographers, Woodall Industries, Island Building Blocks, structures of the Smith or Hicks farms. I think we’re looking west-south-west over Carle Place with Glen Cove Road going left to right through the middle. If that’s true, then Old Country Road would be near the upper left corner. The LIMP structures would be the bridges over the LIRR and under Old Country Road. Just a guess for the date but I’m thinking around 1955. No clue for the other questions. 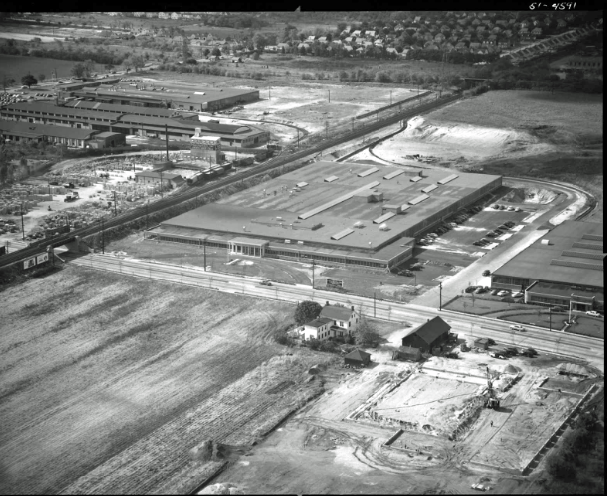 Looks like a Fairchild aerial, October 15, 1951 looking northeast over Carle Place, with Glen Cove running diagonally across the bottom under the LIRR. The Macy’s Furniture Outlet is at center. - Carl Place looking about southwest. 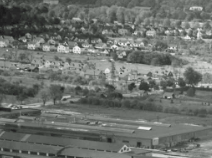 - Glen Cove Rd is the prominent road running left to right across the center of the image. Parallel on the left is Old Country Road, and perpendicular at the top is our beloved LIMP. - Overpasses on the LIRR and OCR, though the latter I can’t really make out. 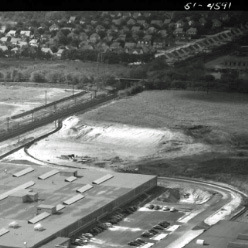 - While I can’t ID the buildings nor collection nor dates I do note that there are echos of the rail sidings still evident in overhead shots, some of the property lines and building shapes were formed around these rails. I faintly remember reading of that business just south of the LIRR but remember none of the details nor where I read that. The photo is taken over Carle place looking towards the Southwest and Mineola and Garden City. The major roads are Glen Cove Rd, Old Country Rd, and Voice Rd. Also observed is the LIRR mainline. The LIMP can be seen in the background with the Mineola LIRR railroad bridge and the LIMP Old Country Rd Highway bridge. You can observe the new warehouses on the new Voice Rd. I would date the photo sometime around 1955. 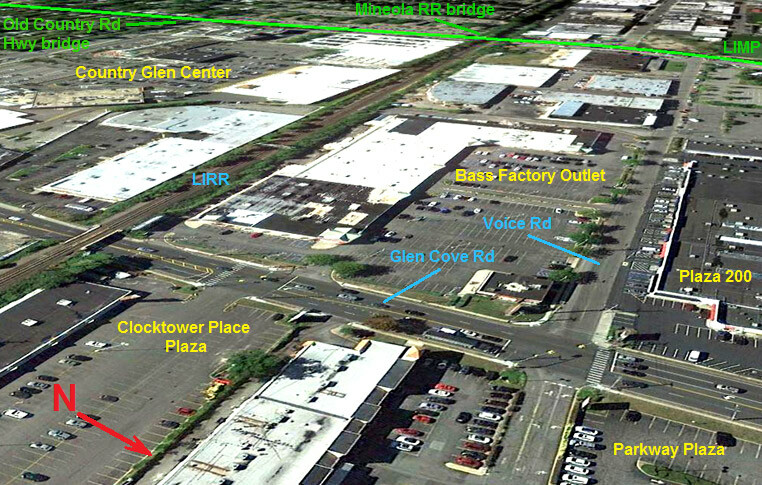 The large building is located on the west side of Glen Cove Rd. between the LIRR and Voice Rd. in Carle Place, the view is to the south west. Today the building, heavily modified, is the home of a number of retail merchants. 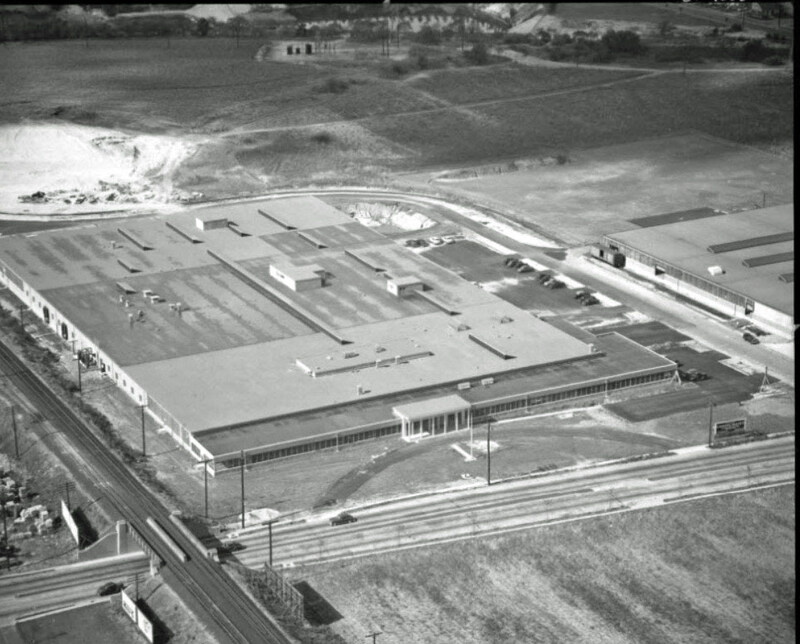 It was built in 1950 on the Charles Wick farm for the Consolidated Lithograph Co. coming from Brooklyn. At the ground breaking ceremonies the first shovel of dirt was turned by Mrs. A. J. Voice, the widow of the founder of Consolidated. You have always wondered how Voice Rd. got it’s name, right? The Motor Parkway can be seen in the distance crossing over the LIRR, barely noticeable in the upper left, the Parkway can be seen going under Old Country Rd. Love these old pics. They are especially great when you intimately know the location. Having grown up around here I know all about this zone. I’m shocked at that really nice farm house and land on the east side of Glen Cove Road. Amazing. All I’ve ever known there are stores and huge parking lots. Definitely no remnants here to be found! I’m sure of that. Al, Interesting about Voice Road. Thanks for the info. I wonder how you knew that!